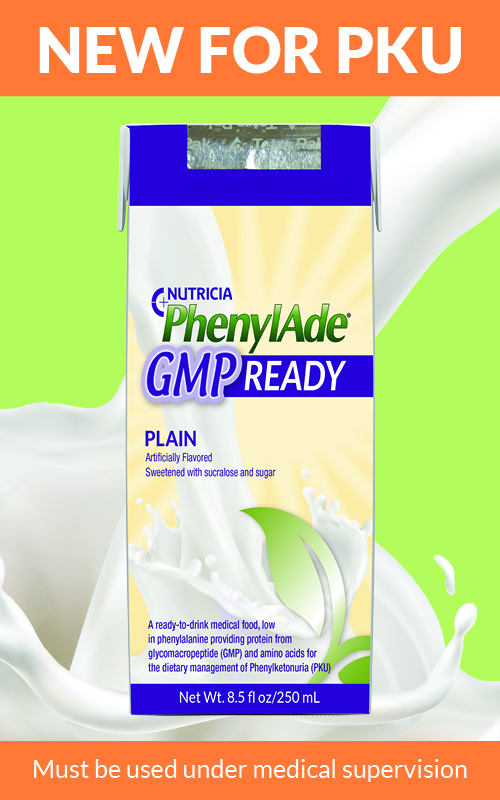 New at Nutricia is PhenylAde® GMP READY, a ready‐to‐ drink PKU formula, providing 10 g protein equivalent and 110 kcal in one drink box (8.5 fl oz). It is also the only GMP‐ based formula with both DHA and EPA, two important omega‐3 fatty acids missing in the PKU diet. Contains GMP, which is made from an intact protein source and is naturally low in phenylalanine. Click HERE to learn more about GMP. A ready‐to‐drink formula can make your life so much easier: from grabbing it in the morning for your breakfast drink to throwing it in the lunch bag for school or work or when you travel. We all have busy lives, and PhenylAde GMP READY is here to provide great nutrition in a convenient drink box. Take the taste challenge as some of your fellow PKUers have done and let us know your thoughts! Always talk to your dietitian before making any diet changes – and contact us if you have any questions about metabolic formulas. Visit MedicalFood.com for more information. PhenylAde GMP READY is a medical food for the dietary management of proven Phenylketonuria (PKU) and must be used under medical supervision.